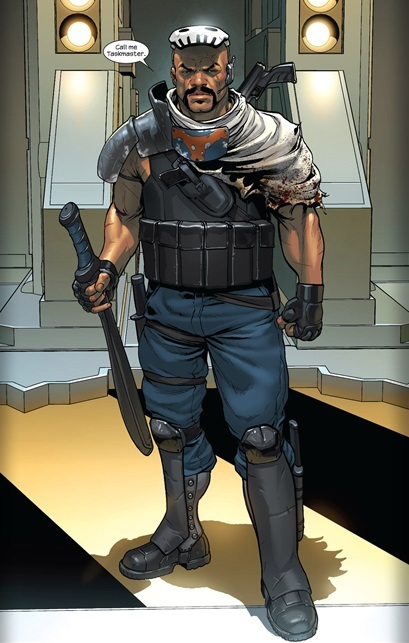 Abilities: Skilled armed and unarmed combatant trained in unspecified martial arts. Powers: He has an unspecified degree of resistance to injury and can absorb and re-channel whatever powers are used against him. Hired by Roxxon corporation CEO Donal to track down Roxxon test subjects Cloak and Dagger [Ultimate Comics Spider-Man #26, 2013]. While tracking his prey he found Spider-man, Spider-Woman and another of Roxxon’s experiments Bombshell. He quickly took down the trio with an illegal paralyzer weapon [Ultimate Comics Spider-Man #26, 2013]. With the heroes unaware of his powers he was allowed to absorb both their super strength and Spider-man‘s venom blast. He almost defeated the heroes when Bombshell, Cloak and Dagger came into play giving him even more power. He was only subdued when Cloak consumed him [Ultimate Comics Spider-Man #27, 2013]. He alludes to working with weapon-X and his connection to the program which created Wolverine [Ultimate Comics Spider-Man #27, 2013].